From the very first arrival of Europeans on North America’s shores, schooling of Indigenous children has served as a tool through which colonizers sought to cultivate their presence on Indigenous homelands. North American peoples, however, had their own methods for teaching their children, many of which continue through to the present. As trade, diplomacy, and (eventually) settlement became increasingly common across the continent though, schooling became an important and dominant site of colonization, attempted assimilation and cultural genocide. For some, especially as settler colonial systems of power became more influential, these institutions were also used as tools through which Indigenous peoples might defend their homelands, communities, and nations. 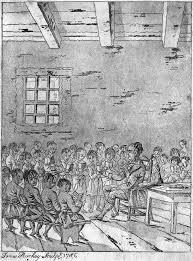 In this module we have brought together two primary documents and one secondary source to help you understand the complexity of education and schooling children during the eighteenth and early-nineteenth century. We have, however, reversed the usual order of our modules. Here, read the historical interpretation first. It covers the period before the one discussed in documents one and two, pushing you to think about the complex ways Indigenous peoples and colonizers engaged with systems of schooling. The historical documents pick up where the article ends, providing insight into the early development of the residential school system. Document one provides selections from Walter Bromley‘s damning 1822 report into the operation of the New England Company School at Sussex Vale in New Brunswick. Though a full accounting is not possible in this brief account, Bromley’s report essential lays out the problems that would later develop with the Residential School System and the Sixties Scoop. Document two acknowledges Bromley’s critique – indicating that the school was closed because of these abuses – and then demonstrates how the company honed its gaze on the Six Nations of the Grand River. Thomas Peace, “Borderlands, Primary Sources, and the Longue Durée: Contextualizing Colonial Schooling at Odanak, Lorette, and Kahnawake, 1600-1850” Historical Studies in Education, 29:1 (Spring 2017), 8-31. History of the New England Company… during the two years, 1869-1870 (London: Taylor & Co., 1871), 75-78.